On 8 November 1895, Wilhelm Röntgen discovered an unknown type of electromagnetic radiation. 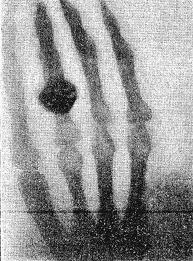 He called this radiation X-rays, using the mathematical symbol x to represent something unknown. Not only did he win the first Nobel Prize for his work in 1901, he also ushered in a new era in medicine, one where it was no longer necessary to cut open the body to investigate an ailment. In fact, he unwittingly realized this potential early on when he used his wife’s hand to make the first X-ray image. With the devastation of World War I and II, X-rays became widely used and have become a vital instrument for doctors and dentists ever since. Compared to today, medical diagnosis in the late 1800s was very primitive. To investigate ailments, doctors were limited to their own five senses. The senses of sight and smell were able to detect exterior signs of disease. (We hope they didn’t taste their patients too often.) Investigating the interior without dissection the body was more difficult. The sense of touch helped with broken bones or foreign objects lodged within the body, but swelling at the site could make diagnosis difficult. 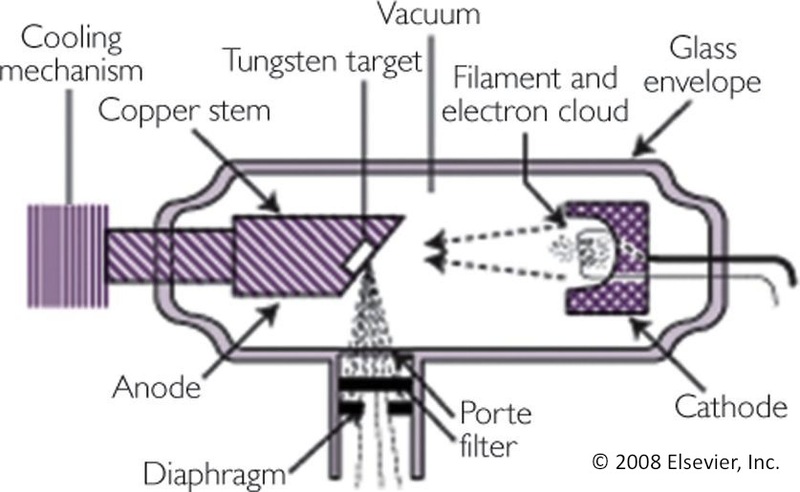 Aiding hearing, the stethoscope magnified sounds in the body. However, diagnoses relying on touch or sound were always dependent on a mental image the doctor created of the patient’s innards. And this mental map could look quite different from reality. With X-rays, however, doctors could make a real image of a patient’s insides, which, as you can imagine, greatly improved medical treatment. In our post about archaeology, we mentioned the electromagnetic spectrum and some uses of infrared radiation — radiation with wavelengths slightly longer than visible light. In this post, we jump to the other end of the electromagnetic spectrum. X-rays have wavelengths much shorter than visible light. In medical uses, a tube like this is used to create short pulses of X-rays that are aimed at the patient. Some photographic film is placed behind the patient. X-rays are blocked somewhat by denser materials like bones and pass more easily through less dense materials like tissues. A shadow forms on the film where X-rays are blocked. When developed, the film turns darker where more X-rays have hit it, so denser objects like bones appear lighter on the final X-ray. As useful as this simple technique is, more advanced techniques have also been developed. A CT (computed tomography) scan, for example, is a series of images made by passing the X-ray tube in a circle around a patient. Thousands of images are made from many directions and these images are then compiled to form a 3D image. Now, the next time you visit the dentist, or go through security at an airport, or break a bone, you can thank Mr Röntgen for his discovery! Tanis was once the thriving capital of Ancient Egypt. Between the 11th and 8th centuries BC it was a large, rich city, its economy based on commerce, its proximity to the sea making it an important post for seaborne trade throughout the Mediterranean. The prosperity of the city accounts for the construction of the largest temple ever built in Egypt, dedicated to the chief deity Amun. Three thousand years later, however, Tanis is nothing more than an undeveloped stretch of land to the east of modern San-el-Hagar, scattered here and there with ruins and partially excavated areas. At least, this is how we see it with our own eyes. The human eye is surprisingly limited when we consider its capacity for detecting light or, in broader terms, electromagnetic radiation. The human eye is capable of detecting wavelengths – colors – ranging from about 400 nm (violet) to about 700 nm (red), roughly the size of a virus. But light – electromagnetic radiation – exists in many other wavelengths, too; it’s just that our eyes aren’t sensitive to them. The entire electromagnetic spectrum extends from gamma rays, with wavelengths smaller than the radius of an atom, all the way to radio waves, with wavelengths up to a thousand miles long! If our eyes were sensitive to infrared light, however, our view of Tanis would look quite different, and this is precisely what some archeologists have in mind. Dr. Sarah Parcak, an Egyptologist and archeologist at the University of Alabama, uses infrared satellite images to search for undiscovered ancient settlements in Egypt. And the results are astonishing. With funding from the BBC, the imagery of Tanis uncovered a maze of streets and structures that had been buried for nearly two millennia. So how does it work? The imaging satellites are equipped with special infrared cameras that are able to detect small differences in temperature between different materials. Think of the night-vision goggles you’ve seen in action films. People can be detected in the darkness with the goggles because their bodies are much warmer than their surroundings. Likewise, walls made of mud brick are warmer than the surrounding soil, sand, and vegetation. This is because they are drier and denser than the surrounding material, which means they retain more of the heat they absorb. And the cameras are sensitive, able to detect object 1 m (3 ft) in diameter from 700 km (430 mi) above the Earth’s surface. No Lost Ark has been found so far. In addition to Tanis, Dr. Parcak and her team have found thousands of tombs and settlements as well as numerous pyramids that have previously been lost to the shifting sands. It will be exciting to see what striking new discoveries will be uncovered with this technique in the future! PS. Another example of infrared light that is closer to home is your remote control. When you press a button on the remote, flashing infrared light is emitted, the frequency of which varies depending on which button you push. Observe it like this. Turn on your digital camera and aim your remote at the lens. The camera is sensitive to light in the near infrared range and you’ll be able to see the flashing light! You are currently browsing the Daily Science blog archives for June, 2011.